Whatever your business, your customers are looking for brands that do more than deliver a great product. First impressions count, and your packaging could make or break your sales. While it is obvious that attractive, stand-out packaging is a must, it is now essential for brands to focus on sustainable packaging to become a more eco-friendly brand. More and more people are focusing on living a greener, more sustainable life and packaging on consumer products is a key way that businesses can capitalise on this. So how can your business become an eco-friendly brand and why should you adopt sustainable packaging for your products. 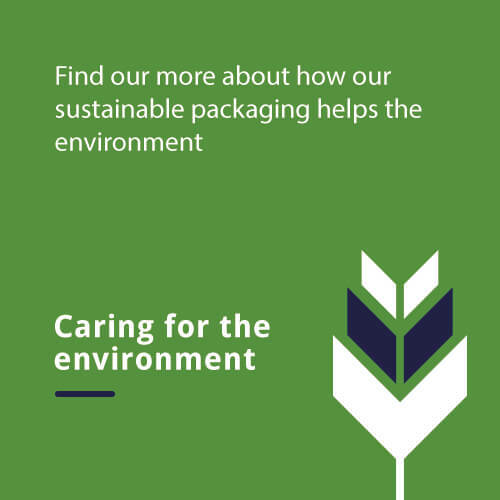 Firstly, sustainable packaging needs to be fit for purpose. The packaging needs to protect the contents adequately. It should be effective in its ability and support responsible consumption. Materials for the packaging should be able to be reused or recycled. The materials should either minimise degradation or be completely degradable. All elements of sustainable packaging should be safe for the environment and for humans. The materials should not pose any risks to health or damage the environment. Sustainable packaging needs to be produced quickly and efficiently. Furthermore, the packaging should be efficient in its ability to support the products through their lifecycle. Sustainable packaging should be developed from renewable and recyclable sources. Furthermore, the packaging process should not use any hazardous process such as using carcinogenic material or harsh chemicals that could pose a threat to human health and the environment. As well as considering the materials, the packaging designer should also consider the amount of material required streamlining the design as much as possible to minimise waste. Minimising waste can come from the machinery on the packaging line too, where technology reduces the amount of waste by scaling the packaging to fit the exact size of the product. Why Should Your Business Adopt Sustainable Packaging? For many customers, excessive packaging is a hassle. Of course, customers want their goods to arrive free from damage, but they also want to be able to recycle their packaging with ease. Often sustainable packaging is lightweight which helps to reduce material waste and reduces the impact of the recycling bin. By generating less waste for the customer, you drastically improve the customer experience. Sustainable packaging does not only benefit the customer but the company too. Typically, sustainable packaging is both streamlined and lightweight. Smaller, lighter packaging reduces the shipping costs for your products which can boost your profits and lower your logistics budget. Thus, this saving can be reinvested to help you find more sustainable packaging solutions. There are many eco-conscious customers out there who will support the brands that encourage sustainability. By positioning yourself as an eco-friendly brand and advertising your sustainable packaging, you could open the business up to a new market and a huge number of potential customers. Adopting sustainable packaging helps to ensure that your business does not fall behind against your competitors. Sustainable packaging is typically more cost-effective and is often a more lucrative option for business. For example, Coca-Cola claims the business has saved $180 million by adopting more sustainable packaging. By focusing on resource-efficient, consumer-friendly packaging designs you can save money and outshine your competitors. With the growth of e-commerce, businesses are experiencing more and more returns. Of course, the returns add up, and it is important for companies to have a quick turnaround time to get products back on the shelf to maximise selling potential. Having strong, reusable packaging will be beneficial for returns. Not only does this allow customers to have an easier returns process (a massive boost for your brand) but also minimises the waste for your business and allows the team to get products ready to sell again as quickly as possible. As purchasing behaviour continues to develop, your selling and packaging will need to adapt to these changes quickly. Sustainable packaging is not only a hot consumer trend now but will help you to transition into the best packaging process for the future. Focusing on customer attitudes and feedback can help you to develop sustainable packaging that continues to gives your brand an edge over your competitors.